A 7-year-old boy was diagnosed as histiocytosis after a peripheral tissue biopsy when he was 2 years old and completed the course of chemotherapy with vinblastin and prednol. 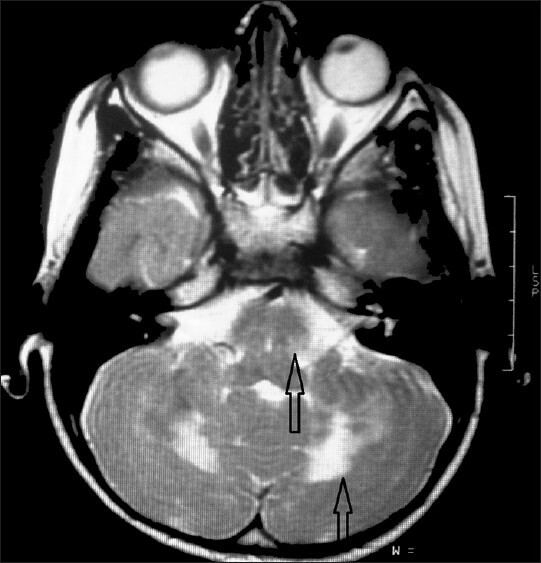 Four years after the diagnosis he presented with subacute onset of truncal ataxia, diplopia, and mild appendicular ataxia especially while reaching for objects. He also exhibited dysarthria and tremulousness. Fundoscopic examination was normal and telangiectasis was not confirmed in the conjunctiva or skin. No neurological sign was noted in the cranial or peripheral nerves. Cranial MRI performed for cerebellar signs, revealed bilateral symmetric lesions on the cerebellar dentate nucleus, middle cerebellar peduncle, and dorsal pons defined as hyperintensities on T2 and FLAIR, which are referred to be neurodegeneration [Figure 1] and [Figure 2]. His ataxia gradually improved during follow-up but lesions remained stable in control MRIs performed 3 and 9 months later. 2. Prosch H, Grois N, Wnorowski M, Steiner M, Prayer D. Long-term MR imaging course of neurodegenerative langerhans cell histiocytosis. AJNR Am J Neuroradiol 2007;28:1022-8. 3. Van der Knaap MS, Arts WF, Garbern JY, Hedlund G, Winkler F, Barbosa C, et al. 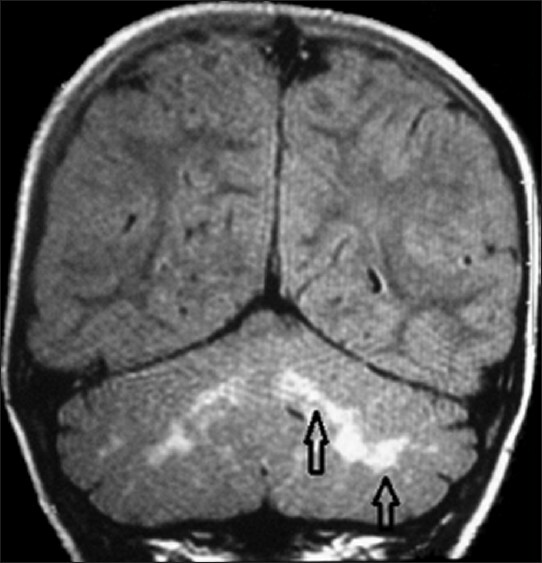 Cerebellar leukoencephalopathy: Most likely histiocytosis-related. Neurology 2008;71:1361-7. 4. Grois N, Prayer D, Prosch H, Lassmann H. Neuropathology of CNS disease in Langerhans cell histiocytosis. Brain 2005;128:829-38. 5. Grois N, Fahrner B, Arceci RJ, Henter JI, McClain K, Lassmann H, et al. Central nervous system disease in Langerhans cell histiocytosis. J Pediatr 2010;156:873-81.